How to make your 4-legged friends and their owners gallop to your business? Answer is through these custom 3.12 x 3.5 inch horse shaped horse care full color magnets – 20 MIL. It will easily convey the purpose of your business and moisten up minds of all those, who see it regularly. This magnet being created out of eco-friendly objects makes a perfect gifting choice around Earth Day, when the emphasis is on environment friendliness. Value savings can be availed on bulk orders along with free shipping, free online design proof and free art set up can be availed on these orders. 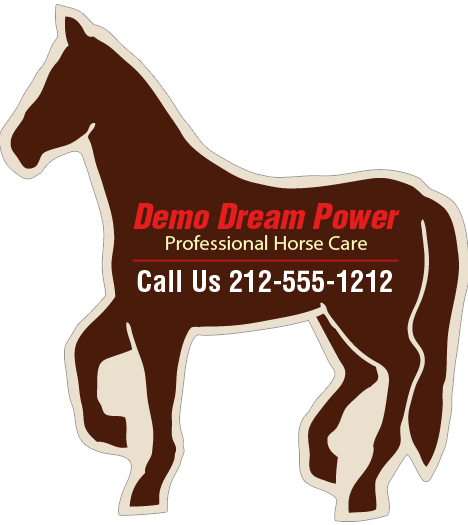 Request a quote to know discounts on bulk orders of these custom 3.12 x 3.5 inch horse shaped horse care full color magnets 20 MIL. Imprint area – 0.75x 2. Product Size : 3.12 in. x 3.5 in.